Robert’s Sister: When was your loved one first diagnosed? Tell us about the process of getting the diagnosis. Jason was diagnosed in 1971. He was 2 1/2 years old. We live in a very rural community in North Dakota so getting a diagnosis was long and difficult. We started at the ER at the local hospital, we were then sent to the nearest neurologist (who was 180 miles away) for testing and examination. Over the course of several years, we went to the Mayo Clinic four times, the University of Wisconsin, Gillette Children’s Hospital in Minnesota and the University of Minnesota. It was a long, difficult journey, not just mile-wise, but mentally and physically. We now have a neurologist in South Dakota and at The Epilepsy Group in Minneapolis, Minnesota. Robert’s Sister: How did you feel when Jason was first diagnosed with epilepsy? Scared, confused, angry, sad and helpless but hoping somehow it would all work itself out in the end with an answer as to why and, of course, with seizure control. After 41 years, sadly, we do not know why and Jason still continues to seizure on a daily basis. But now, I feel okay. It is what it is and we just take each day as it comes but truthfully those feelings I had in the early years still creep in from time to time. Sad is the one that gets me the most. Robert’s Sister: Did your family treat Jason differently after the diagnosis? If so, how? Jason's younger brothers grew up knowing Jason as a brother who had seizures so, no, they just accepted him as he was. The extended family, of course went through the same emotions as we did but overall he wasn't treated all that differently, we were just more cautious for reasons of safety. Robert’s Sister: Did the kids at school treat Jason differently because he had epilepsy? Yes, but not always in a bad way. Jason was a pioneer of sorts at our local school. No one previously had seizures to the extent Jason did or had behavior or mood problems (caused by medication) like Jason. So for teachers and students alike it was a learning process. Of course, there were always someone who teased but for the most part the kids at school and the teachers were protective of him when it came to seizures. But he was also left behind as far as forming friendships, mainly because the kids just didn't understand why he acted the way he did. Jason had many years of bad behavior caused by the seizure medications he was on so kids tended to leave him alone. They were friendly from a distance but responded if it was required because of a seizure in the classroom or on the playground. Jason was in Special Ed with mainstreaming out to a few classes. For the most part, we had very understanding teachers for Jason who were easy to work with. Robert’s Sister: What treatments has Jason tried? What has worked? What hasn’t worked? Jason has been on practically every medication out there. None have really worked. Most caused horrible behavior and mood swings so we finally settled on Carbatrol and Lorazepam which control the behavior the best. On all the meds he still continued to seizure so it just was a matter of deciding which med gave him the best quality of life without turning him into a zombie. He still averages 30 seizures a month which may seem like an unacceptable number but it just is what it is. Besides the medications, he had a Temporal Lobe Lobectomy in 1983 which failed and a Vagus Nerve Stimulator Implant in 1999 which also failed. He was just hospitalized a year ago for two more medication trials (“black label” drugs) and tests. Neither medication worked and from the testing and because of his past history, the neurologists at The Epilepsy Group informed us there were really no more options for Jason at this time. Robert’s Sister: Do you think the medications affect how Jason feels? When Jason was first diagnosed with epilepsy, I became an ARC member and was on the ARC Board for many, many years. I was also involved with Spark, a local parents group. We worked with other parents, teachers and administrators and the community educating them about special need children and adults in our school system and community. I also helped, along with many others, in making the dream of a sheltered workshop and group home in our community a reality. I am now a Crowdrise member trying to raise awareness and funding for epilepsy. How has it not! From the moment of Jason's first seizure, the whole dynamic of our family changed. I quit my job. Instead of vacations, we spent time in clinic or hospitals. We spent time trying to convince Jason's brothers he wasn't being favored because of the amount of time his dad and I devoted to his care. We spent time trying to deal with the guilt I felt, because I knew that is exactly how his brothers felt when they were younger. Having to ask family members to "watch" Jason from to time for one reason or another and knowing they really didn't feel all that comfortable taking care of him if one of us weren't there too, so I just quit asking. I could go on and on, since I think it affected every aspect of our life in one way or another on a daily basis. But, 40+ years later, despite the seizures and all that goes with that, life is pretty darn good compared to what many others face in their own little corner of the world. I read somewhere that if we all threw our troubles in one big pile, we would probably still take our own back compared to what's in that pile. Robert’s Sister: What is your favorite memory of Jason? Jason giving his younger brother by eight years advice. His brother had come home for the weekend from college tired, depressed and confused about where he wanted to go in his life. And, as his Dad and I discussed this with him most of the weekend, Jason sat quietly on the couch probably taking in every word said but saying nothing. When his brother came to say goodbye to him before heading back to college, Jason got off the sofa and looked at Ryan and said, "You know, Ryan, you can choose happy or sad. I choose happy, what do you choose?" Simple as that! Ryan said it was the best advice of the whole weekend. That piece of advice Jason gave his younger brother has stayed with me all these years. If he can choose happy after all he has been through, then seriously, how can I complain how a life of epilepsy has affected me and my life? Robert’s Sister: Do you ever wish Jason didn’t have epilepsy? Every second, minute, hour, day, week and year. To just be aware of the stigma and fear that still surrounds those that live with epilepsy in the schools, workplace and life in general. And of course the first aid that goes along with someone having a seizure. Jason will be 44 in a couple of months. 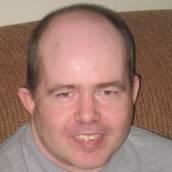 He works at ABLE, Inc. (a sheltered workshop here in town), five days a week, lives at home with us, still thinks of his two younger brothers as his big brothers and is an uncle to three nephews and two nieces who are so gentle and kind to him. He loves his sofa, movies, puzzles and books and accepts life for what it is and never complains about anything. If anyone asks if he is having a good day, he will always nod yes. He still chooses Happy even if he isn't as verbal as he once was. Jason's Story is on Crowdrise at http://www.crowdrise.com/LindaAndersen. Robert’s Sister: Thank you, Linda, for sharing your epilepsy story! Each day in November we will have a new story about someone affected by epilepsy telling us “What Epilepsy Means to Me.” Check back tomorrow for our next story! If you’re interested in telling your own story about epilepsy, please contact me at robertssister@att.net.